While doing a new-construction home inspection recently, I came across a furnace with no disconnect / service switch in the same room. Usually, it's just a light switch that controls power to the furnace, and it's either mounted on the side of the furnace or on a nearby wall. Instead, there was a lockout at the circuit breaker. 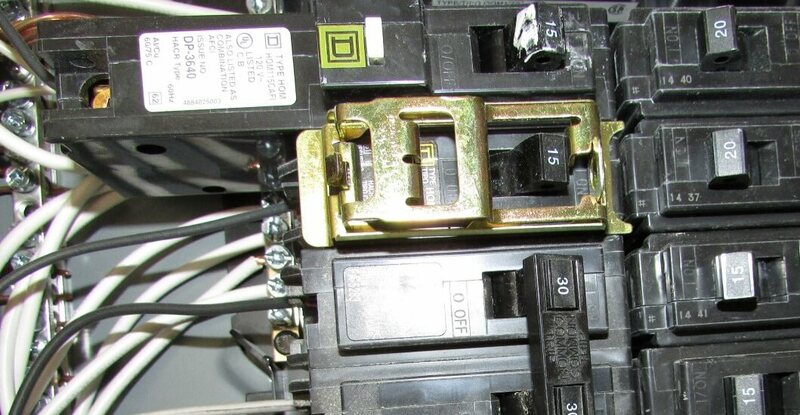 As I mentioned in my blog post about lockouts at circuit breakers, this is one way of providing a disconnect for a permanently installed appliance. At least I think that gold thing pictured above is a lockout device. I've never seen one that looks exactly like that, and I don't understand how one could lock the circuit breaker into the "off" position with this device, but that's besides the point. The point here is that this was the first time I've ever seen a lockout at a furnace circuit, and that means one of two things: I'm going to learn something new, or whoever installed the lock is going to learn something old. The electrical code changes every three years, and I do my best to keep up with the major changes but I sure don't call myself a code guru, especially when it comes to electrical. First, does this section apply? Yes. The blower fan for any furnace will be rated over 1/8 horsepower. Items 1 and 2 tell me the disconnect needs to be in sight of the appliance. 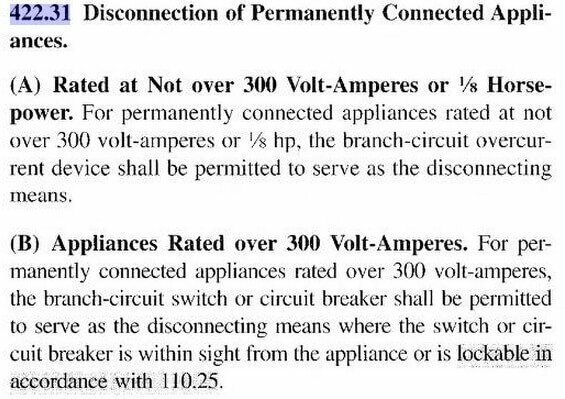 A lockout at the circuit breaker in a different room is not an acceptable method... unless the exception in italics contradicts that. Ok, now I turn to section 422.34 to see what all that's about. Ok, done. 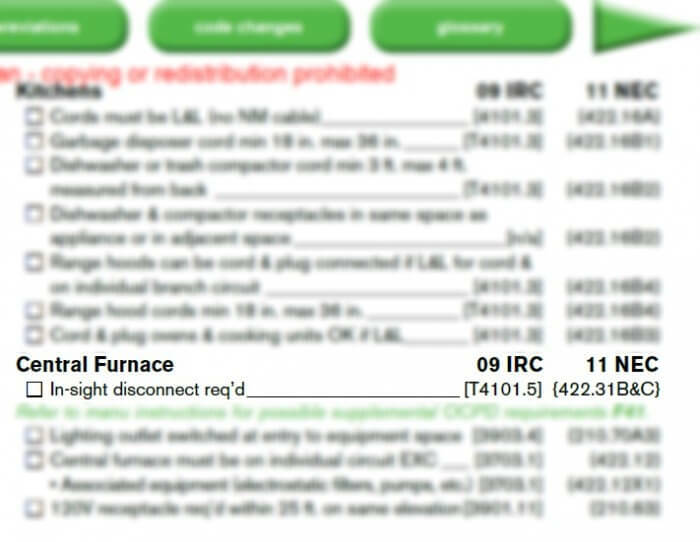 I don't need to read sections A through D, because the furnace doesn't have a unit switch. So there we have it. 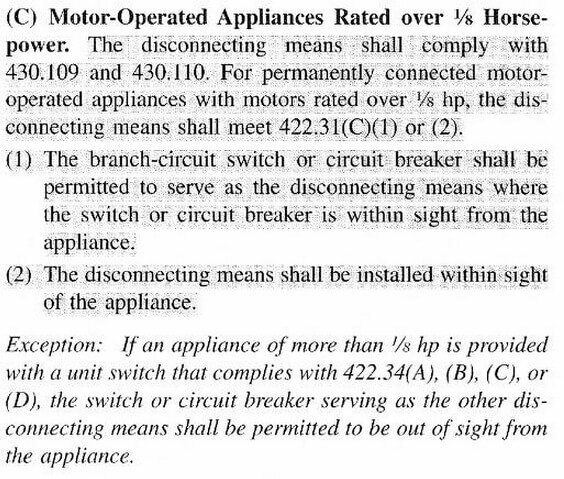 Because a furnace has a blower motor rated at over 1/8 horsepower, it needs a disconnect within sight of the appliance, and a lockout at the breaker is not an acceptable substitute. I have now committed all of this to memory, and I'll never have to look it up again... unless I forget, in which case I'll look up this blog post. Q&A: "Why does water leak through the bottom of my chimney?"